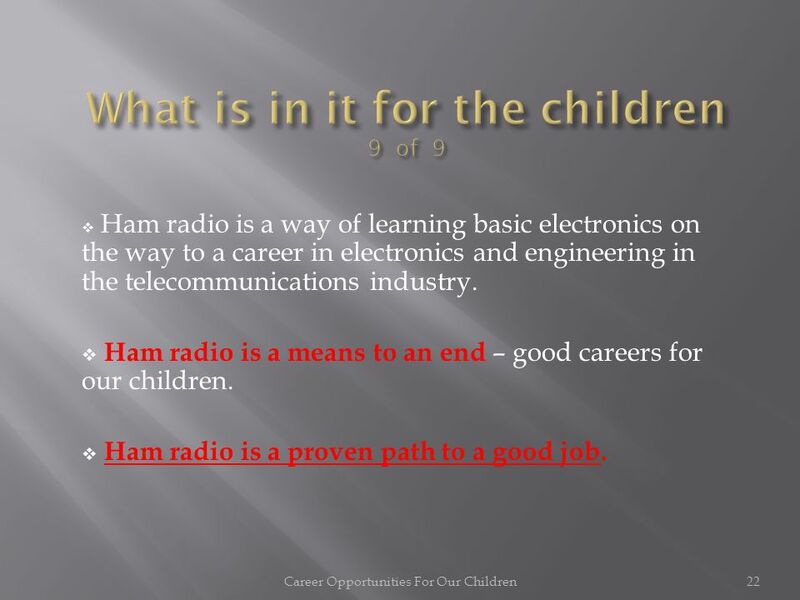 Career Opportunities For Our Children1 2 Good Careers Exposure to electronics Classroom electronics Classroom supported by a Lab Lab is a Ham Radio station. 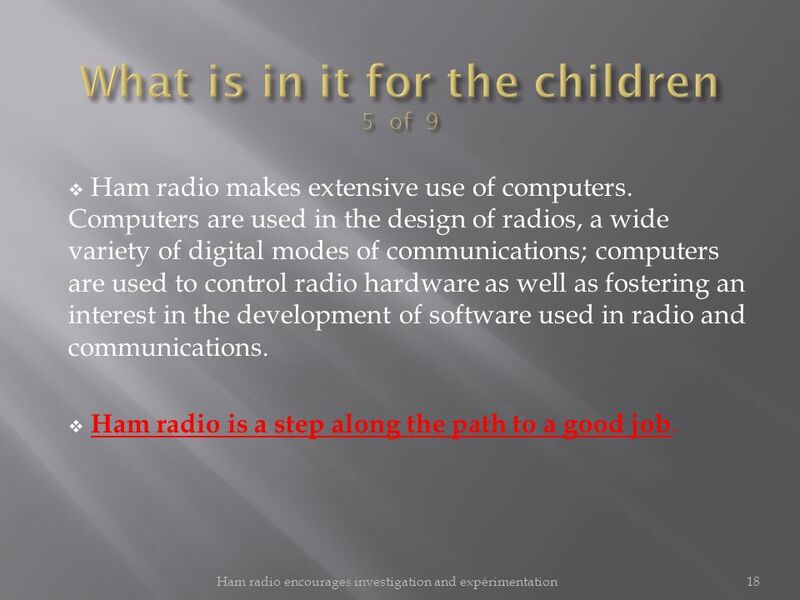 5 Amateur Radio (Ham Radio) and its role in introducing children to electronics, leading to careers in engineering and technical support in the telecommunications industry. 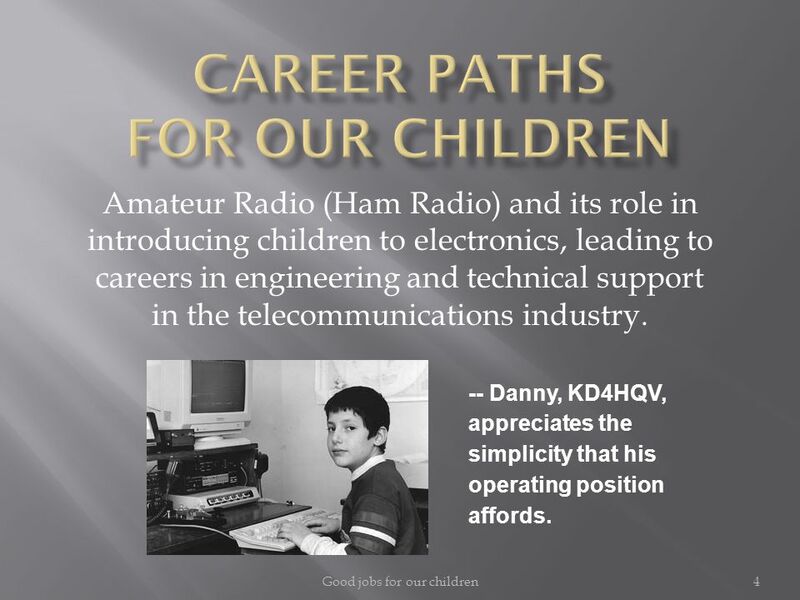 4Good jobs for our children -- Danny, KD4HQV, appreciates the simplicity that his operating position affords. 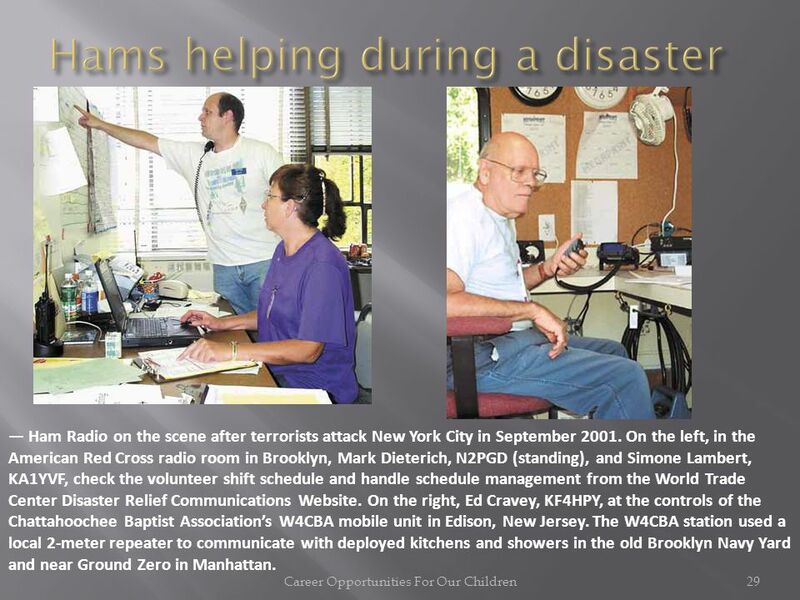 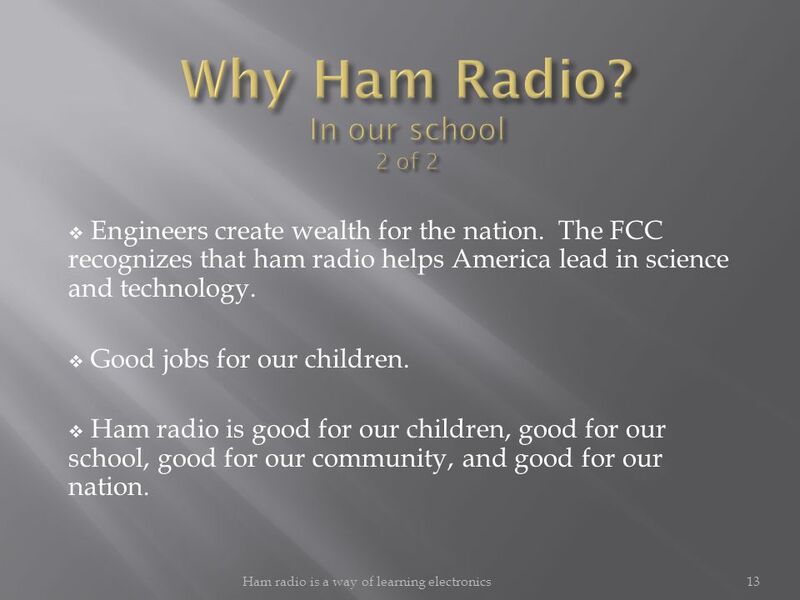 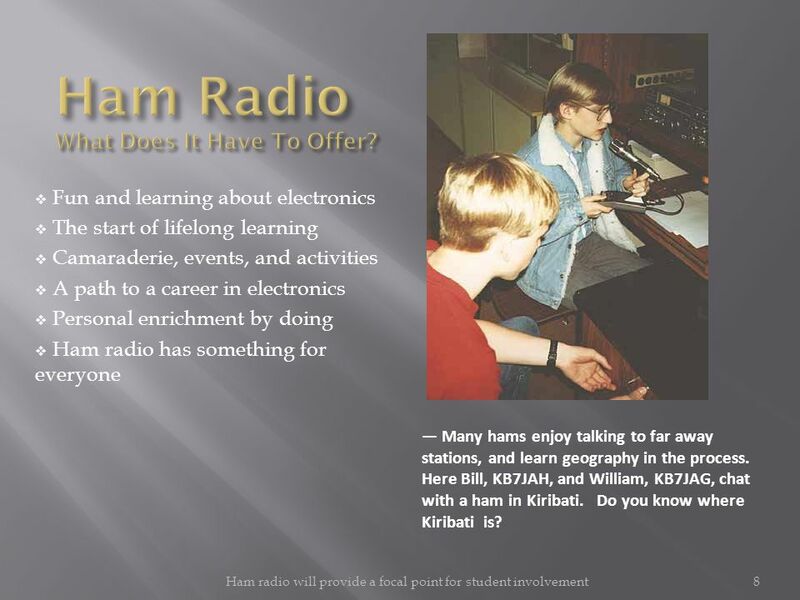 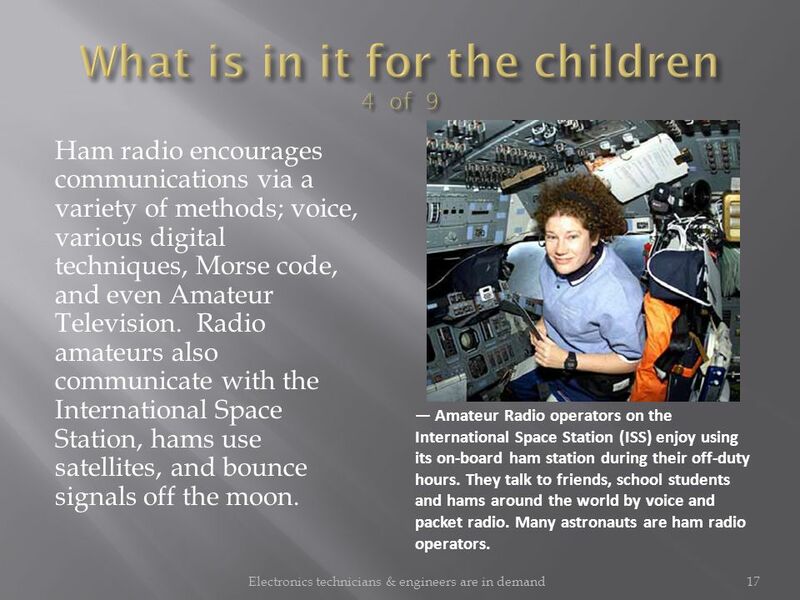 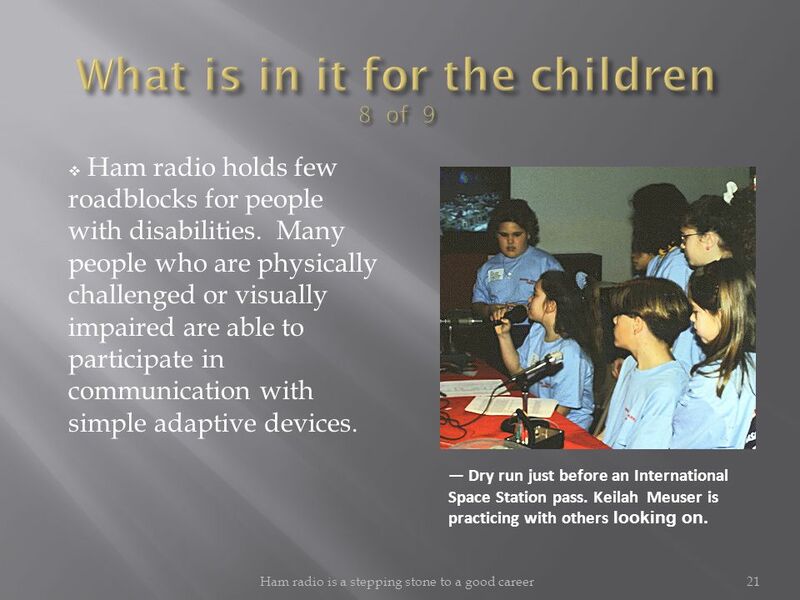 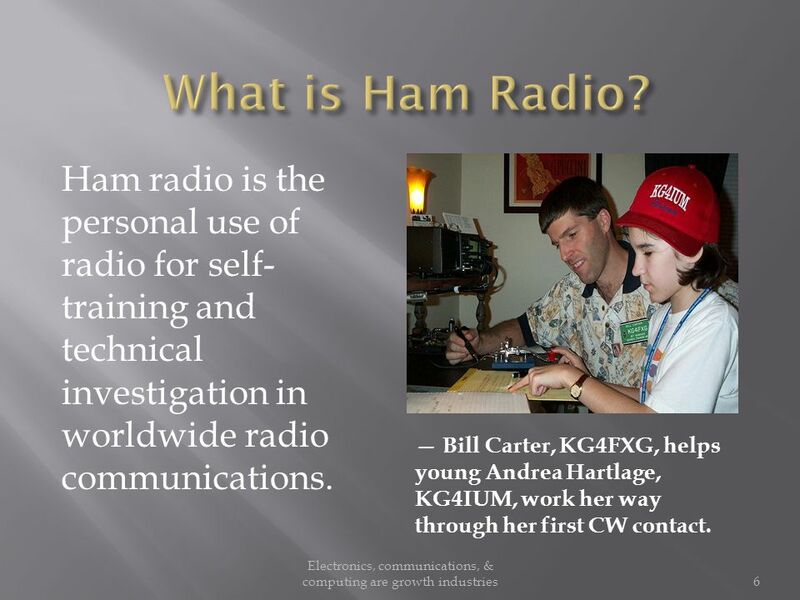 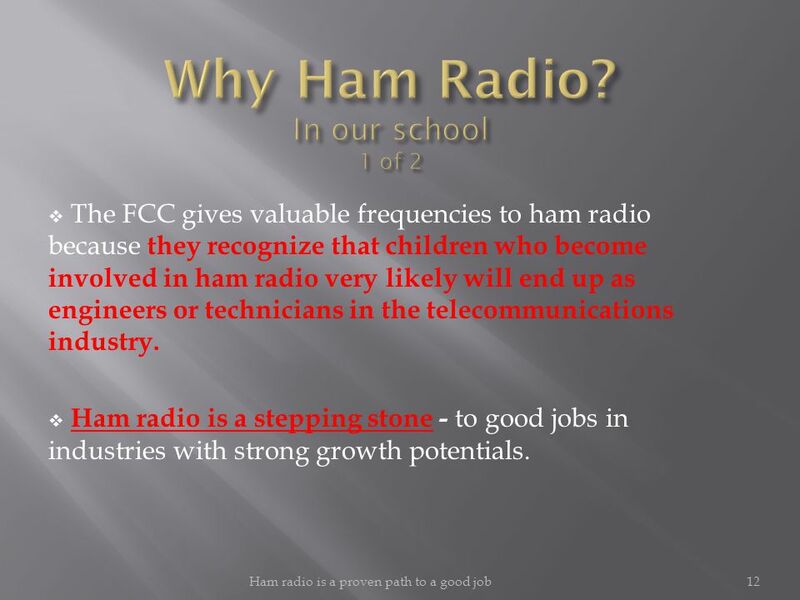 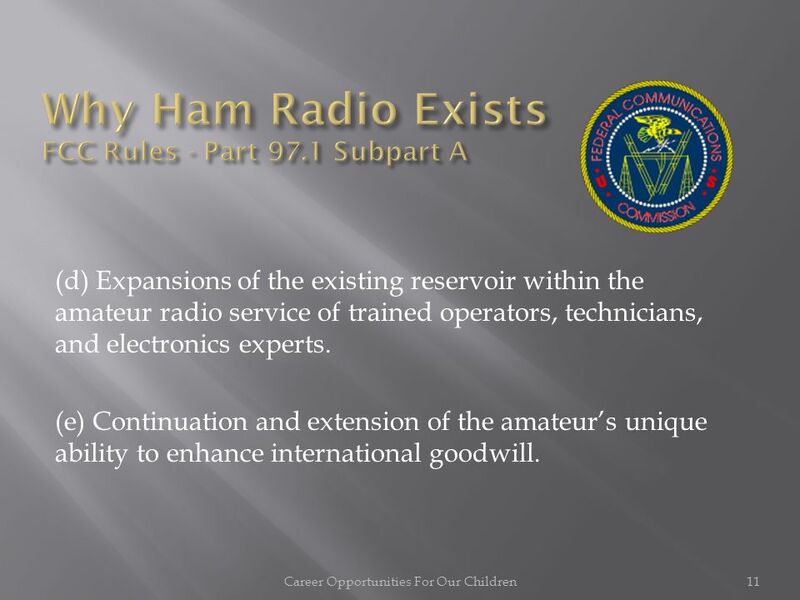 16  Ham radio encourages investigation and experimentation as a basis for understanding technical subjects. 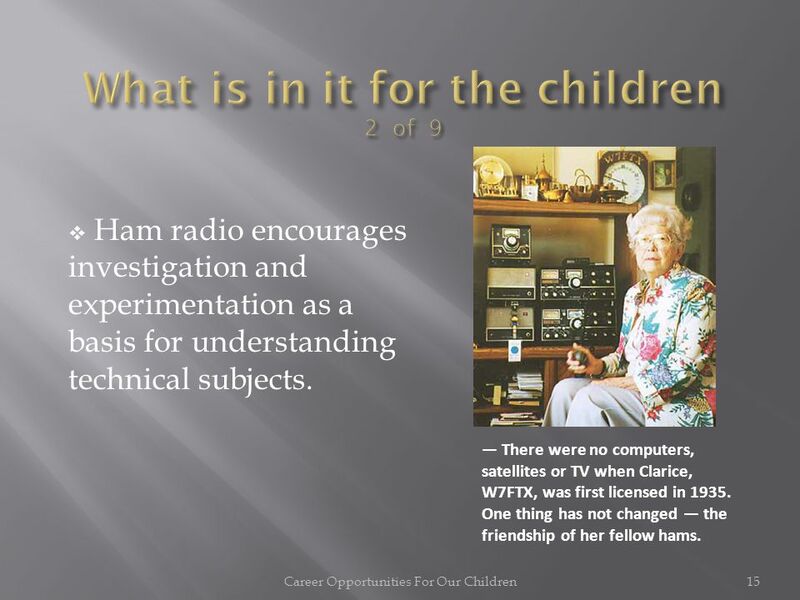 Career Opportunities For Our Children15 — There were no computers, satellites or TV when Clarice, W7FTX, was first licensed in 1935. 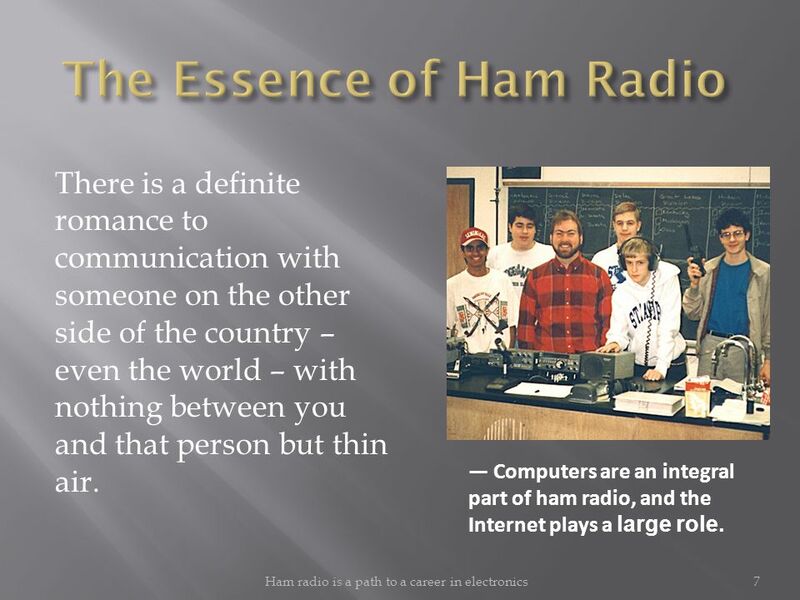 One thing has not changed — the friendship of her fellow hams. 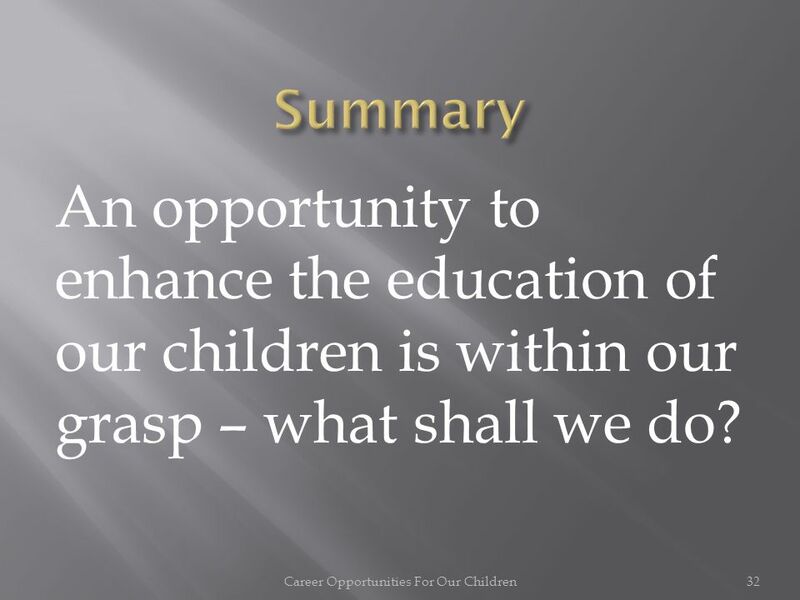 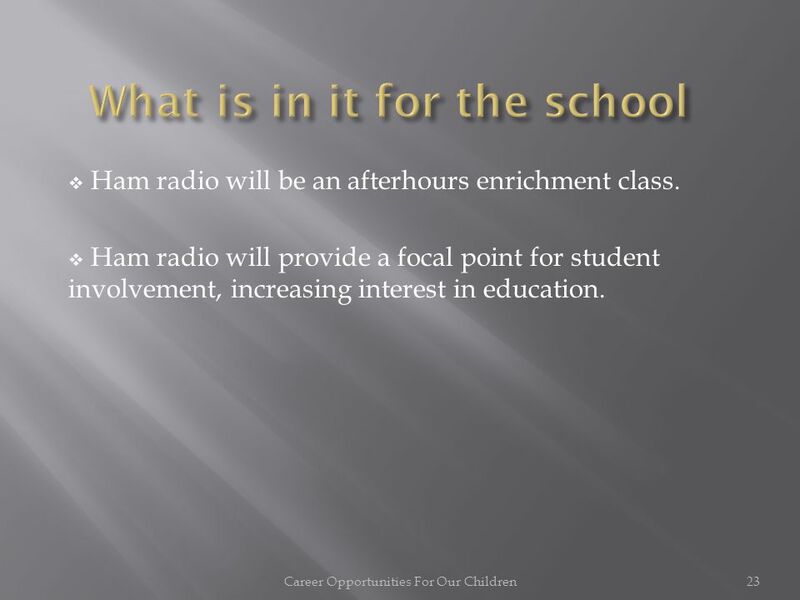 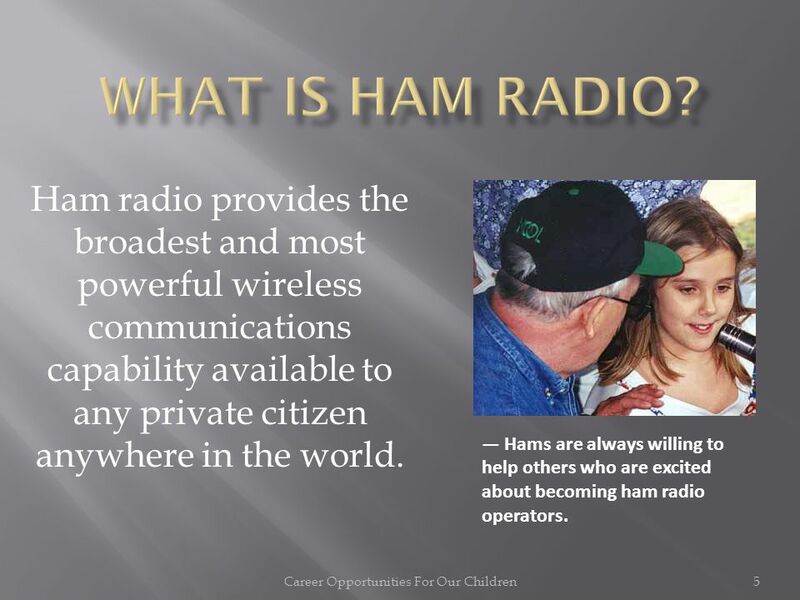 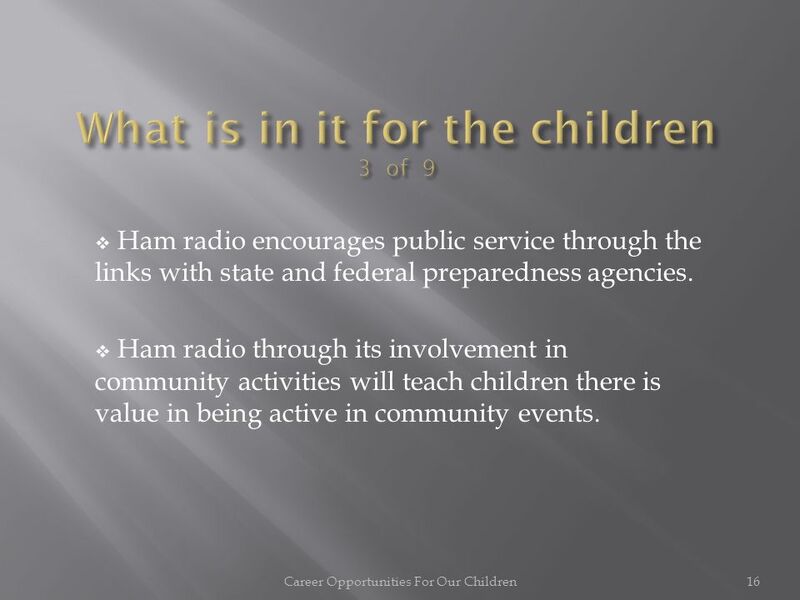 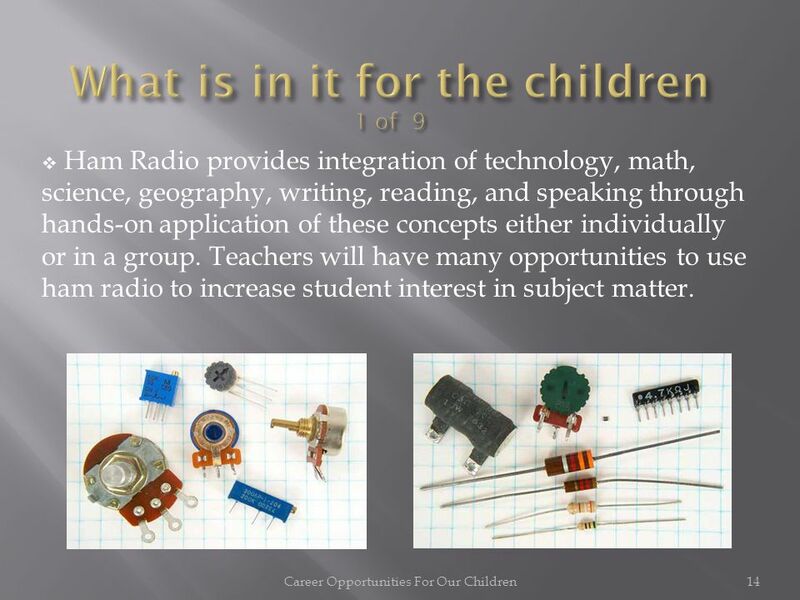 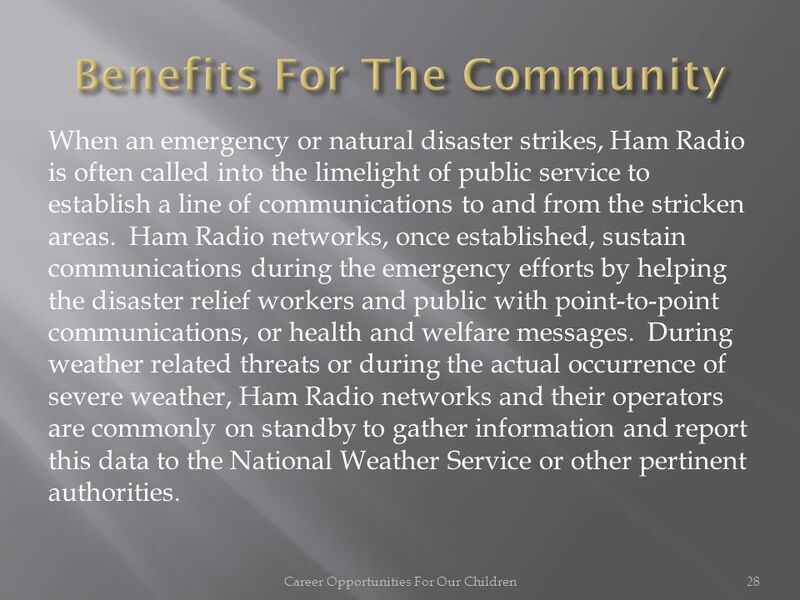 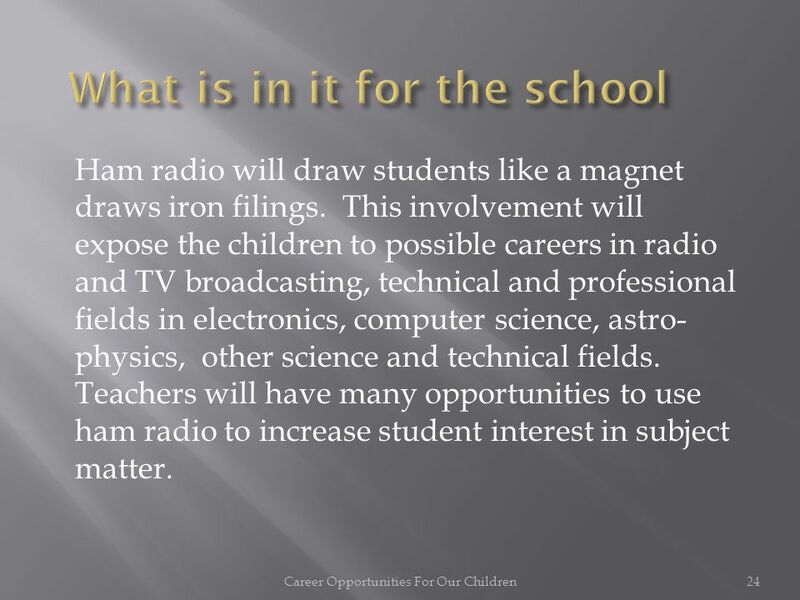 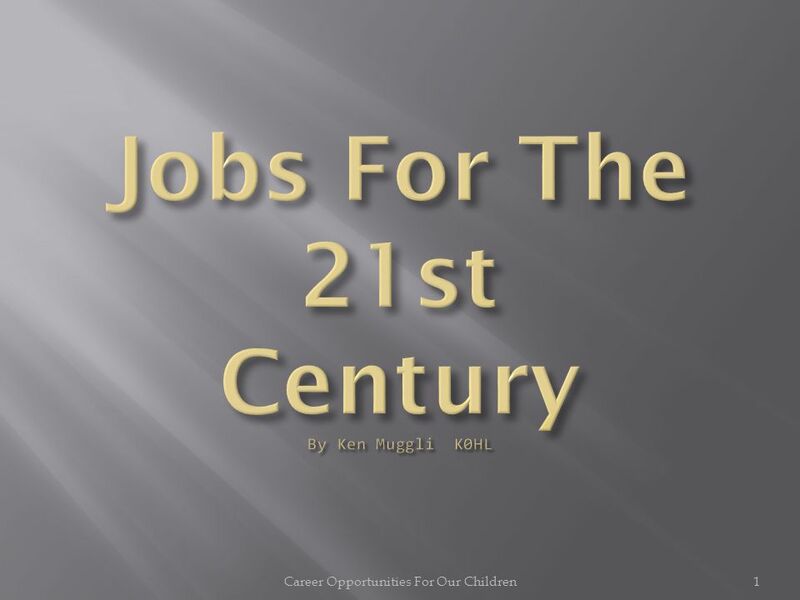 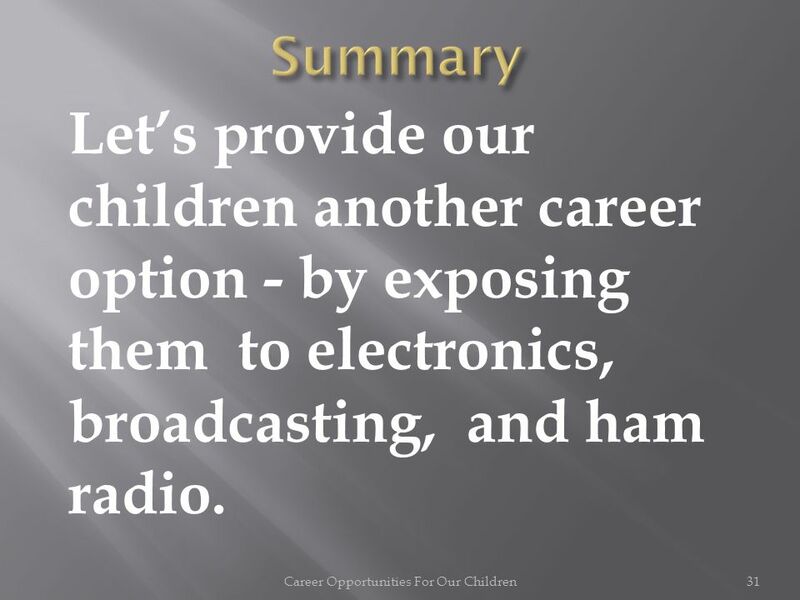 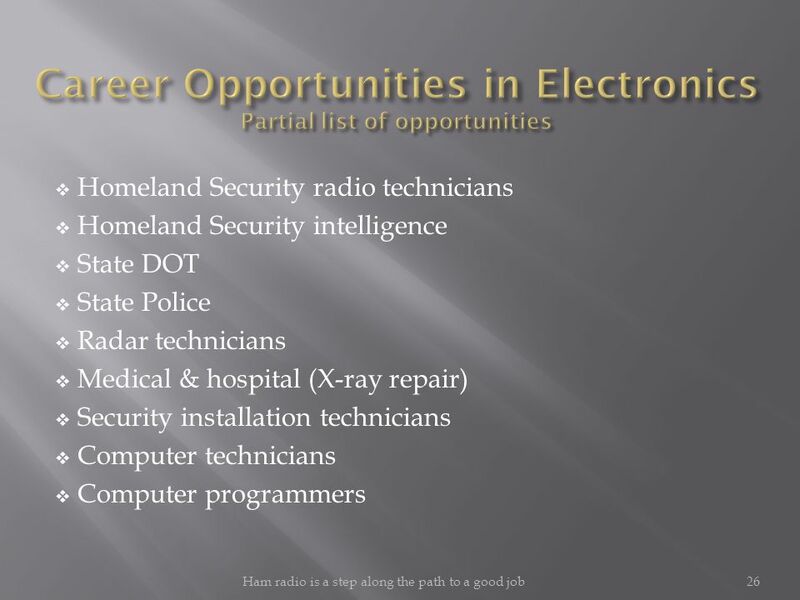 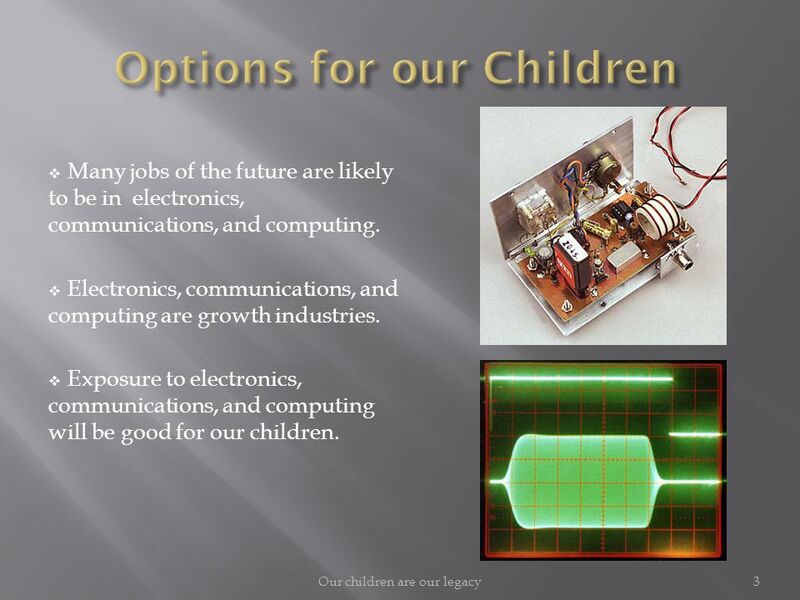 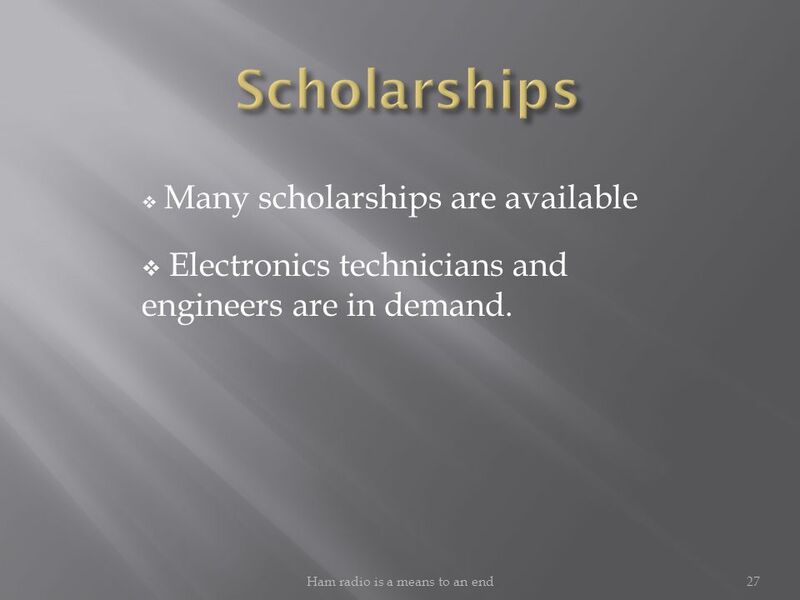 Download ppt "Career Opportunities For Our Children1 2 Good Careers Exposure to electronics Classroom electronics Classroom supported by a Lab Lab is a Ham Radio station." 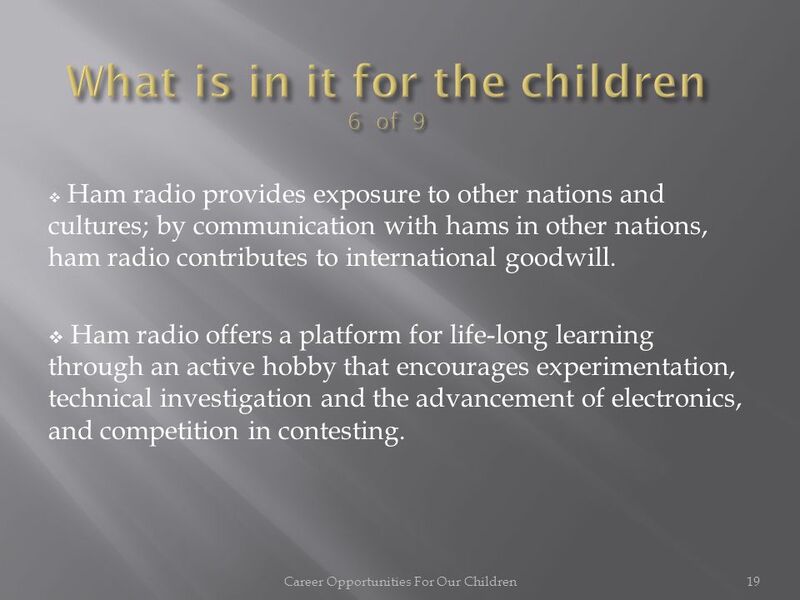 Chapter 19 Lesson Goal After completing this lesson, the student shall be able to communicate effectively by radio and through various reports following. 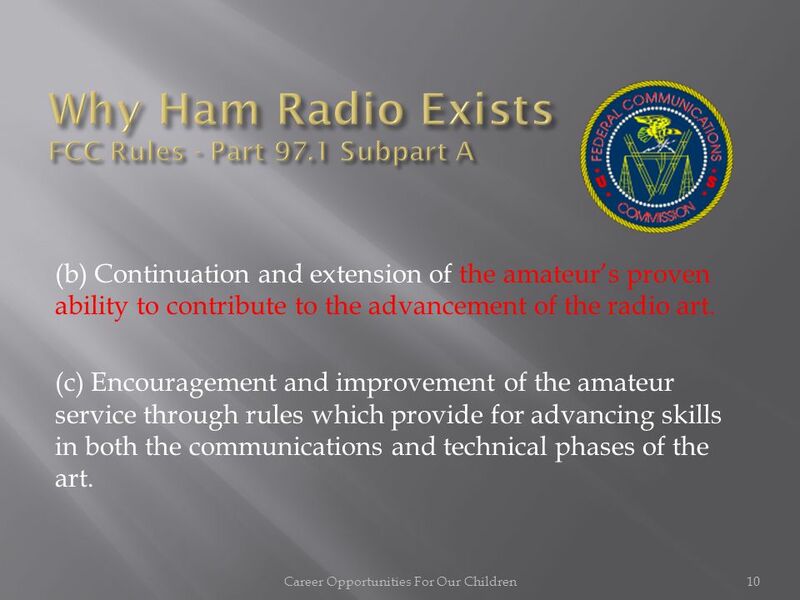 Amateur Radio Technician Class Element 2 Course Presentation ELEMENT 2 SUBELEMENTS T1 - FCC Rules, station license responsibilities T2 - Control operator. 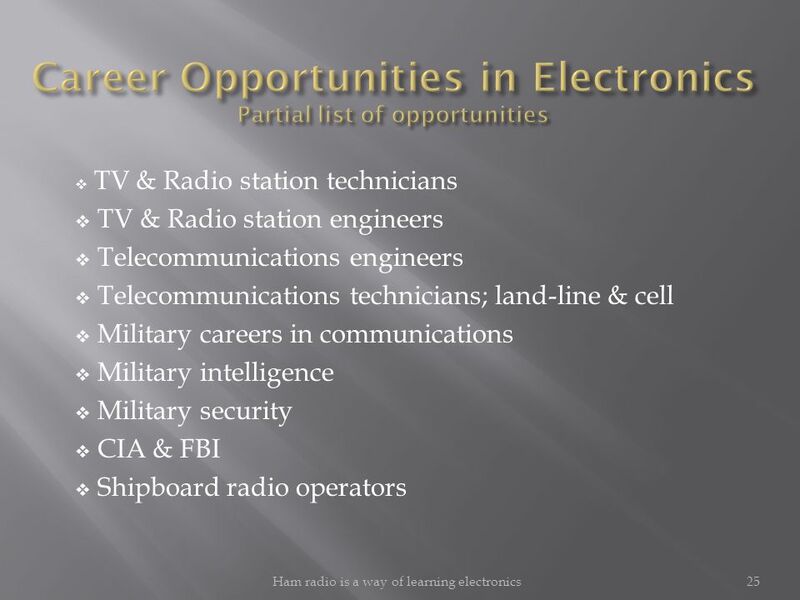 My Rambling Views of the Telephone Industry By Bob Weiss. 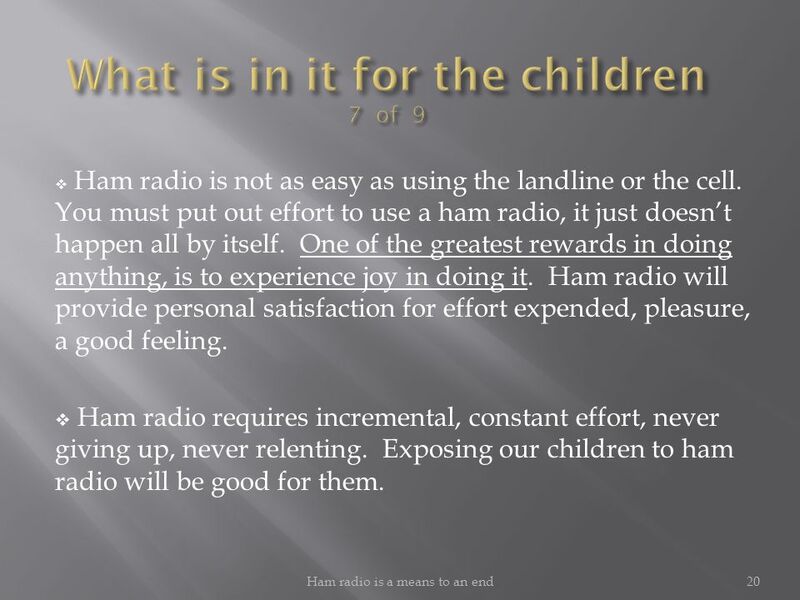 1 Consumer Motivation CHAPTER 8. 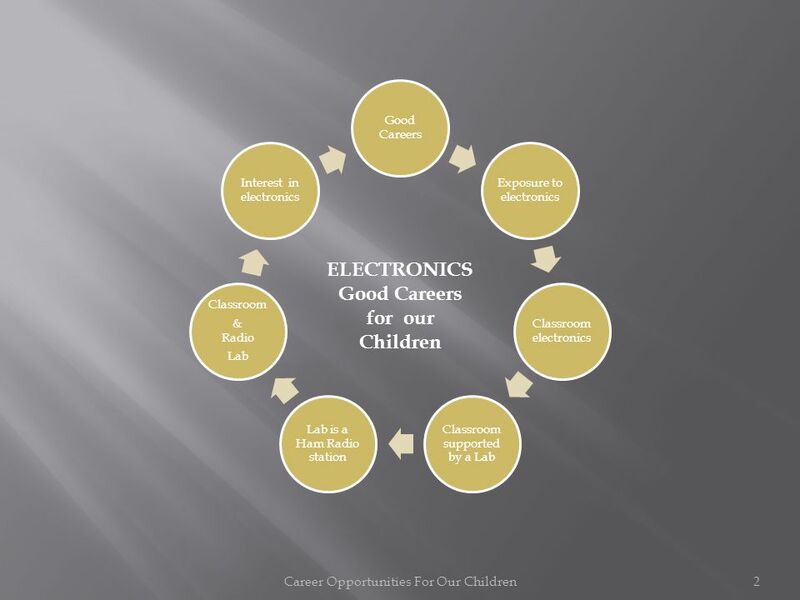 2 Consumer Motivation Represents the drive to satisfy both physiological and psychological needs through product purchase. 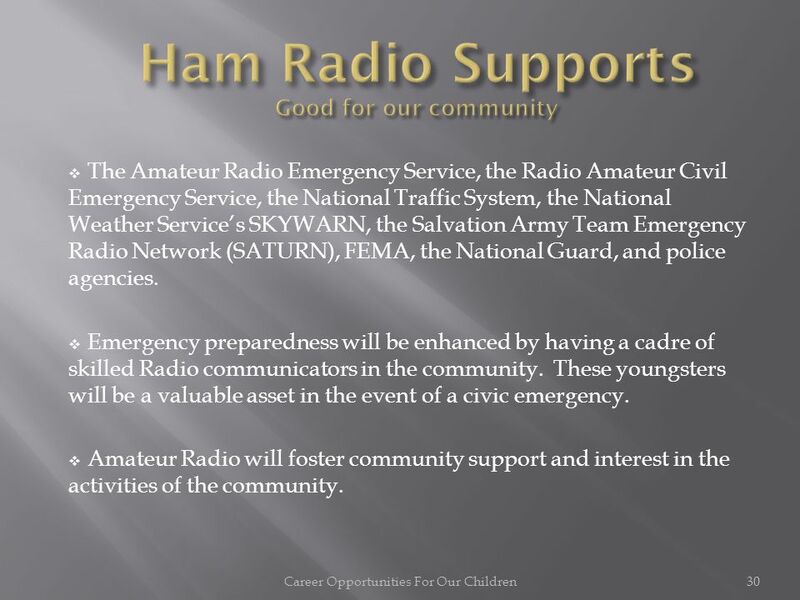 The Role of an Amateur Radio Operator in a Disaster Jay Isbell, KA4KUN ARRL Alabama Section Manager Greg Sarratt, W4OZK ARRL Southeastern Division Director. 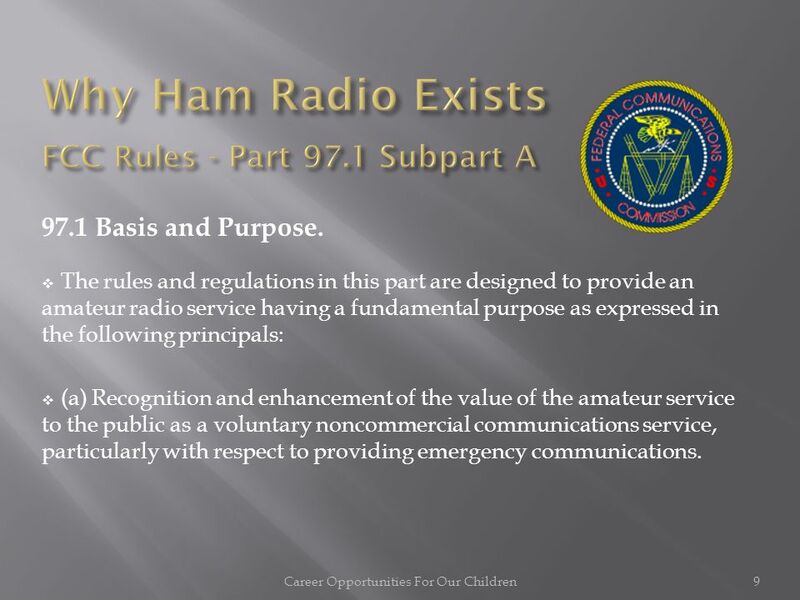 Chapter 5 – Licensing Regulations Licensing Terms Working with the FCC Bands and Privileges International Rules Call Signs.